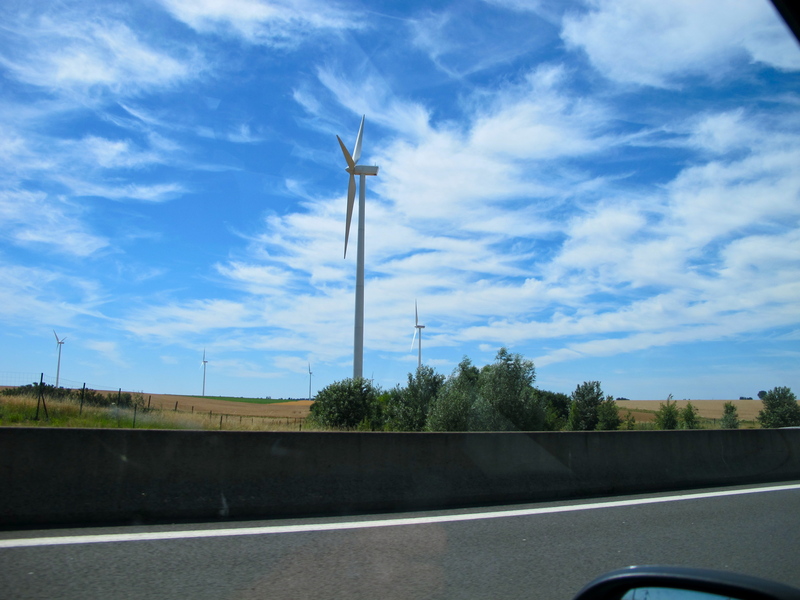 Driving from Belgium to France, and approaching Amiens, the European answer to “global warming” is: windmills. Here we see a cluster, standing still, which is safer for the motorist, in that I personally find them hypnotic. And easier on the birds, who often fly into their blades. You decide if they are worth the desecration of an otherwise beautiful landscape, or in the case of Denmark, a seascape. 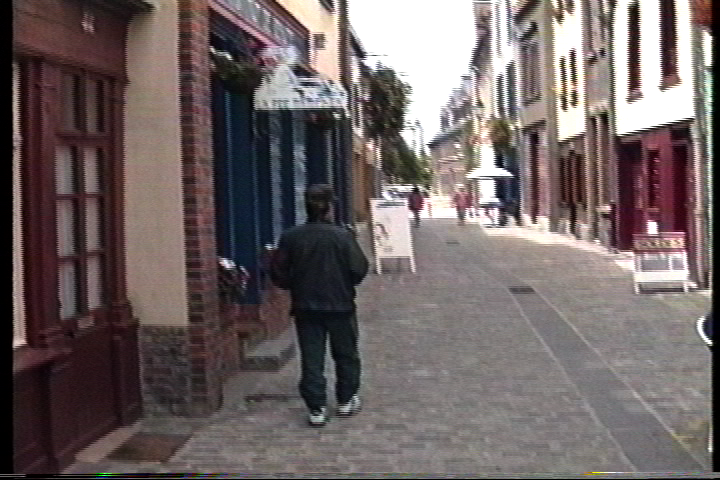 Here our intrepid Co-Producer is seen as a young teenager strolling the streets of Amiens. 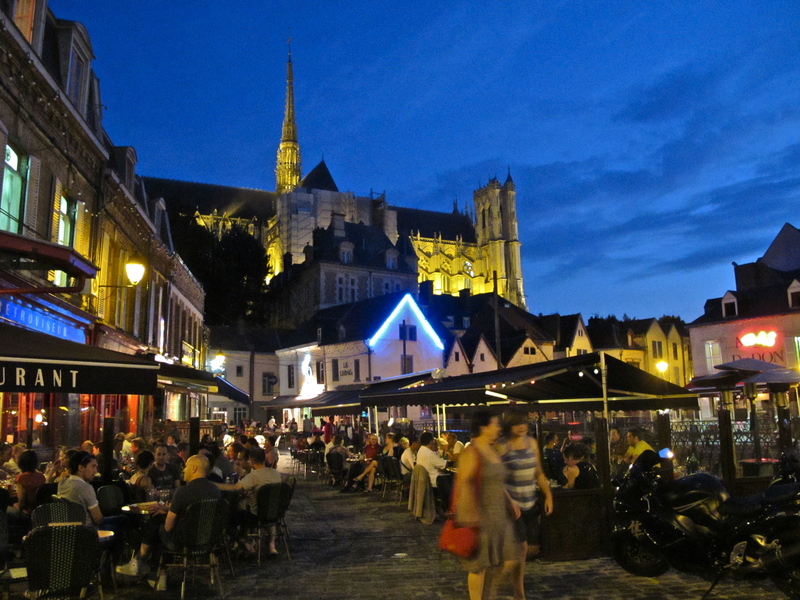 The city is about 100 miles north of Paris, on the left bank of the Somme River. 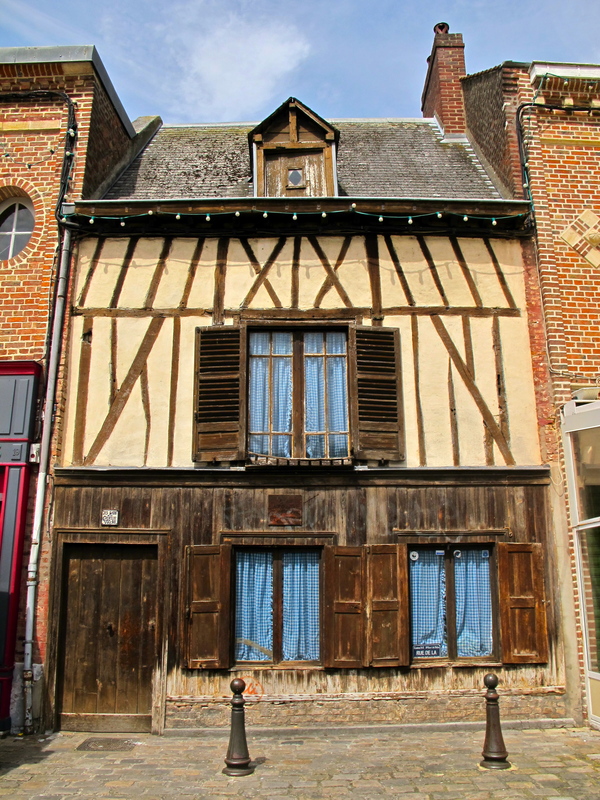 It was the old capital of Picardy, but is now the main city in the Department of Somme. 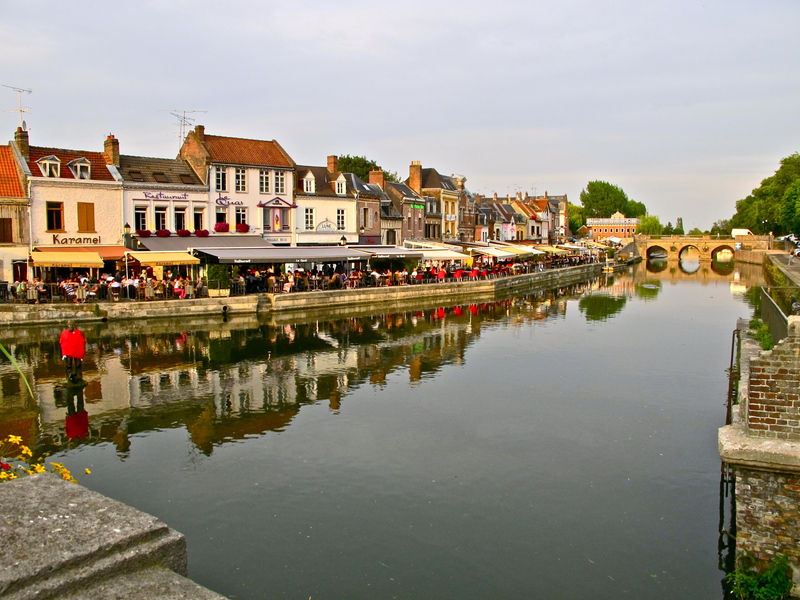 As Samarobriva (“bridge on the Somme”) Amiens was the chief town of a Celtic tribe, the Ambiani, until conquered by Julius Caesar. The city's name derives from these early inhabitants. The martyr St. Fermin was the town’s first bishop. Normans began raiding the area in the 9th century, and it was not until the 12th century that the area fell under the ‘protectorate’ of the French Crown. Spaniards captured the town in 1597, but Henry IV, with the help of the English, sent them back to Spain. 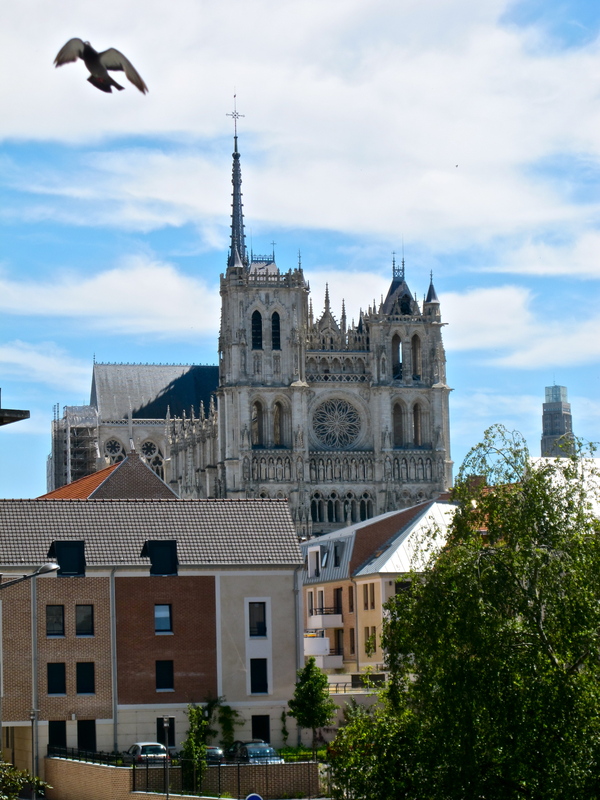 More history: in 1802 the Treaty of Amiens was signed here, putting an end to conflicts between the English, French, Spanish, and the Batavian Republic (Holland). Germans took control in 1870, during the Franco-Prussian War. 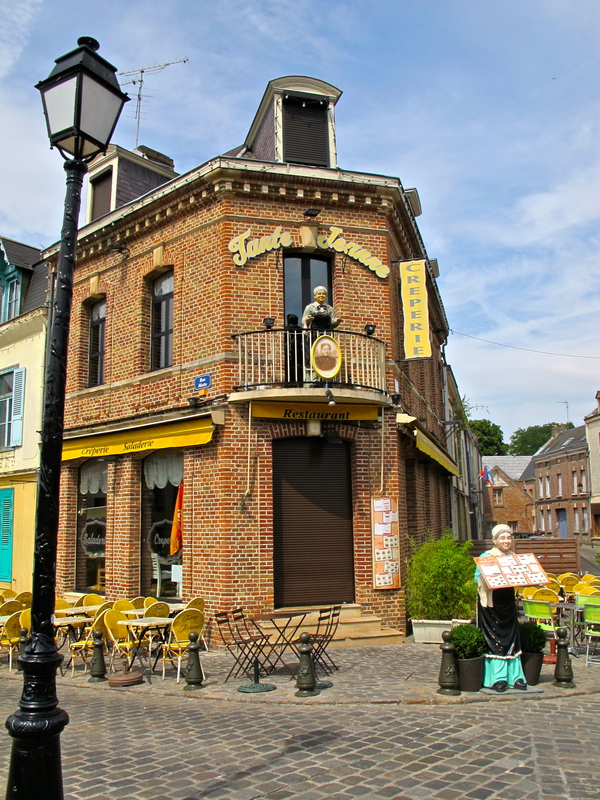 Interestingly, the writer Jules Verne settled here in 1871, and became involved in local politics. The Somme Valley was a decisive area of victory for the Australians and New Zealanders in 1916, and then went on to open the phase of the Hundred Days Offensive, which led to the Armistice in 1918. The city did not fare too well under German occupation during World War II, suffering partial destruction before being liberated. This area is known as Saint-Leu, and we're looking at the docks or Quai Bélu, which was home to weavers, tanners, dyers, and butchers. The area apparently fell into decline at the beginning of the 20th century, until its revival in the 1980's. It is now a flourishing mix of shops, homes, and waterfront restaurants, bars, and cafes, all a few steps and over a bridge from the Cathedral, which we shall soon explore. 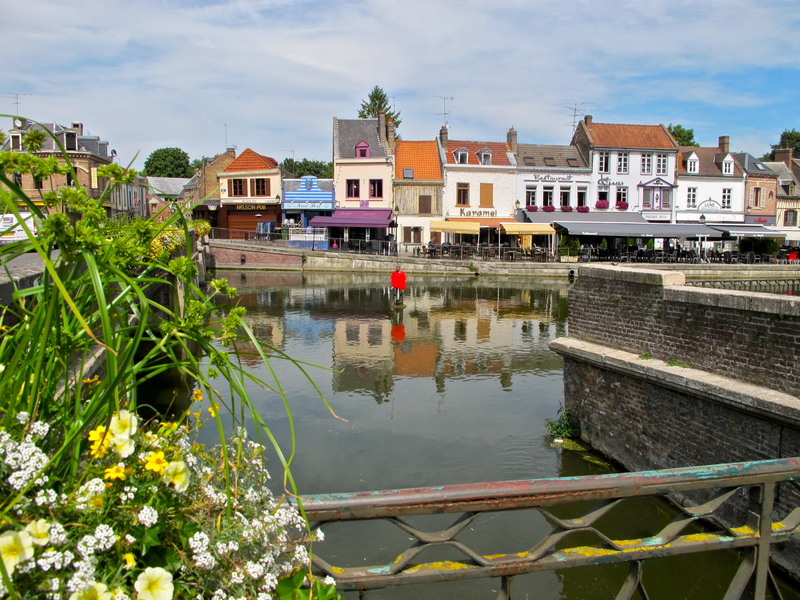 The water is part of a canal system coming off of the Somme. 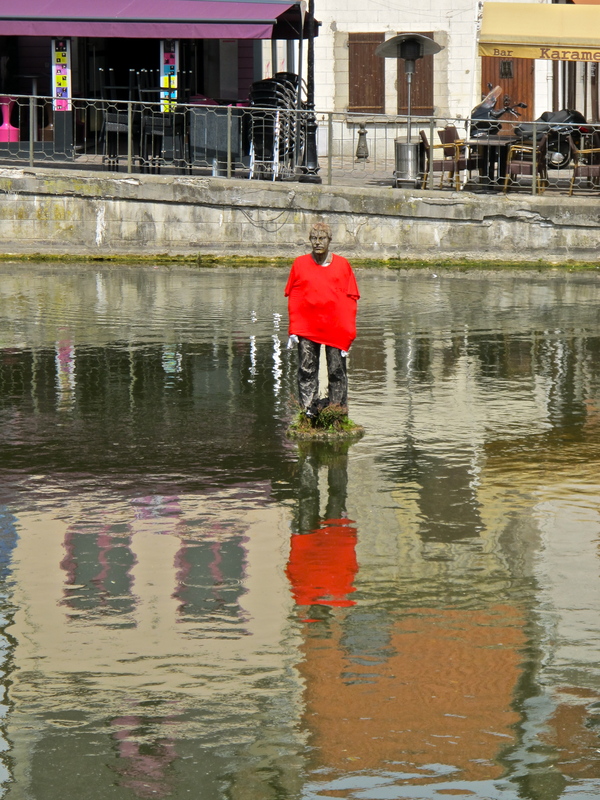 The character that we see in the middle of the water in the Saint-Leu is one of the 3 wooden sculptures made of oak in 1993 by Stephan Balkenhol, a German sculptor. This one is called "Man on the Buoy," and sometimes “Man on the Mud,” depending upon translation, I suppose. The shirt and other bits of clothing or hats seem to change daily. One reviewer states that Balkenhol “investigates the isolated human figure.” It is a wonderful integration of recognizable art situated in nature. 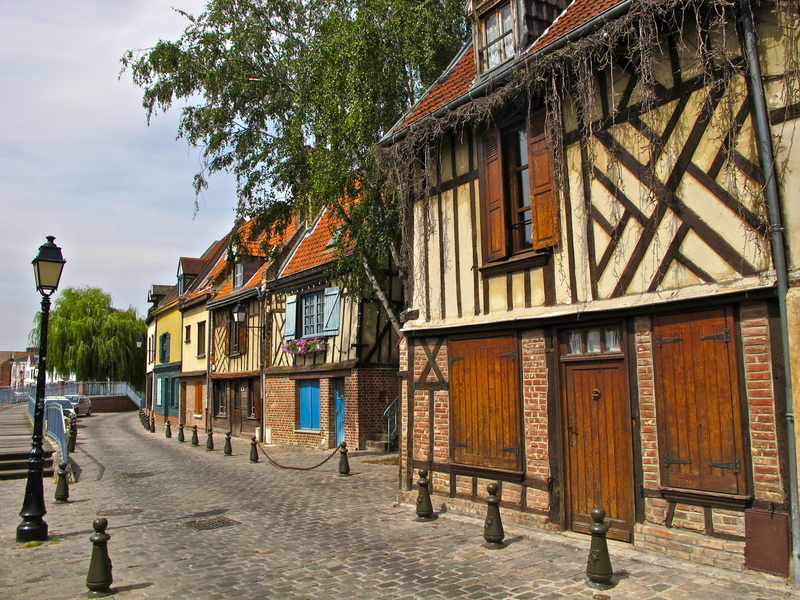 Before exploring the restaurant area, we will head to the left, or northeast and view homes built above shops – the traditional Medieval way of building businesses. Starting with Tante Jeanne (Aunt Jeanne) on the corner – and this is just over a small bridge leading from the Cathedral – we will proceed along the canal. With no evidence of automobiles, it is easy to imagine ourselves back in the 16th century, perhaps even before. 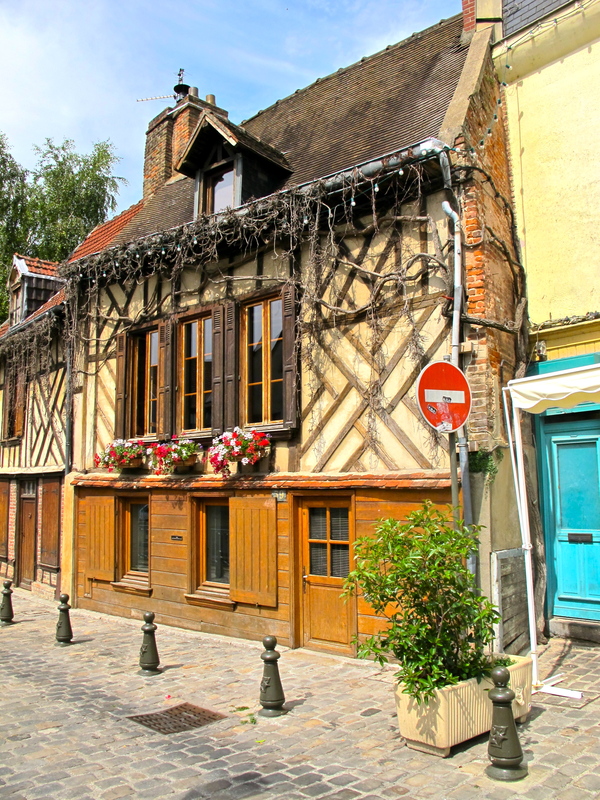 This gem, featuring a brick base, capped with wood on the first level, then half-timber on the 2nd is so very Medieval, and while contemporary with Gothic development in large-scale buildings such as churches and governmental entities, this neighborhood exhibits absolutely no Gothic characteristics. 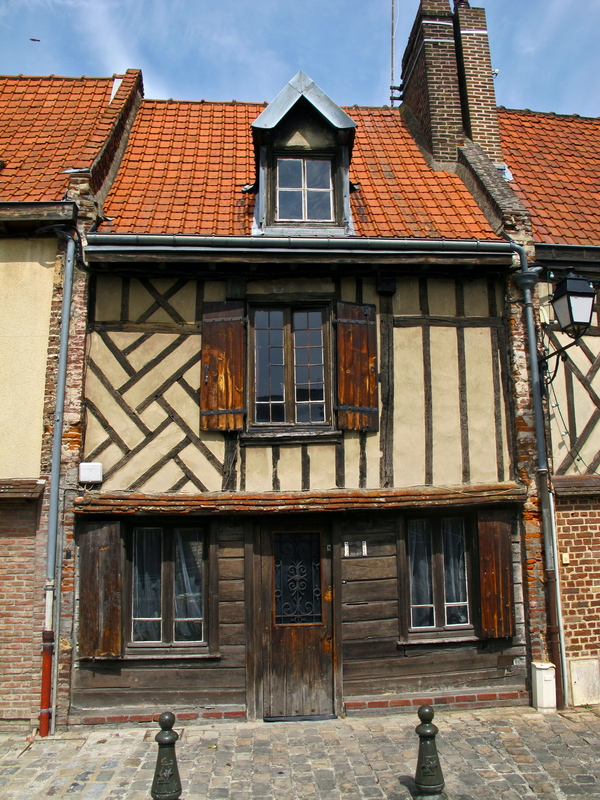 It derives from centuries of wattle and daub. Wattle refers to sticks, branches, twigs making a rough lath, used to fill in the spaces between heavier structural members. The daub was usually plaster or clay, sometimes mixed with straw, to cement the rough lath beneath. This particular house has a very primitive arrangement of the timbers, but do notice they are mirror image symmetrical. Three doors apart, these two are mirror-images of each other, leading to suspicion of collusion on the part of a restoring contractor, though much is old and probably original. 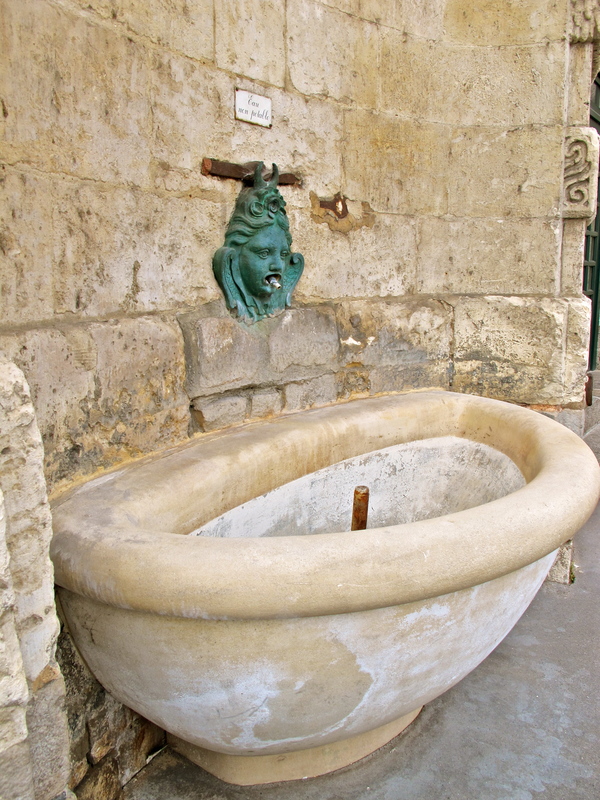 La Fontaine, the Fountain, was part of an 18th century municipal plan to replace Medieval wells with fountains. This Haymarket fountain was built by Mathurin Le Carpentier. The fountains were fed by underground pipes from a water tower. 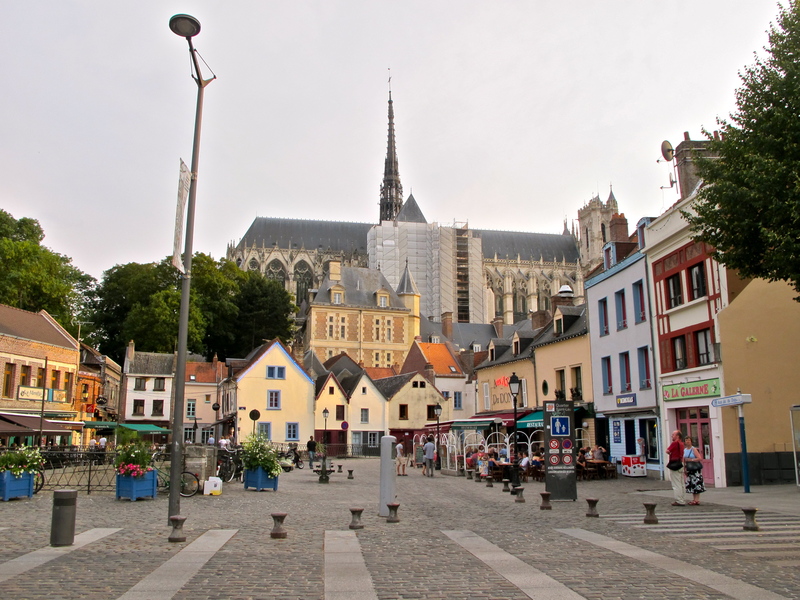 The flow, however, was too weak, and in 1835 a new water supply had to be installed throughout the entire city of Amiens. Stepping onto the small bridge which spans the channel, we have our first glimpse of the Cathedral of Notre Dame, as the sun sets in the west. As with so many religious structures, this one is visible from most of the city.
' 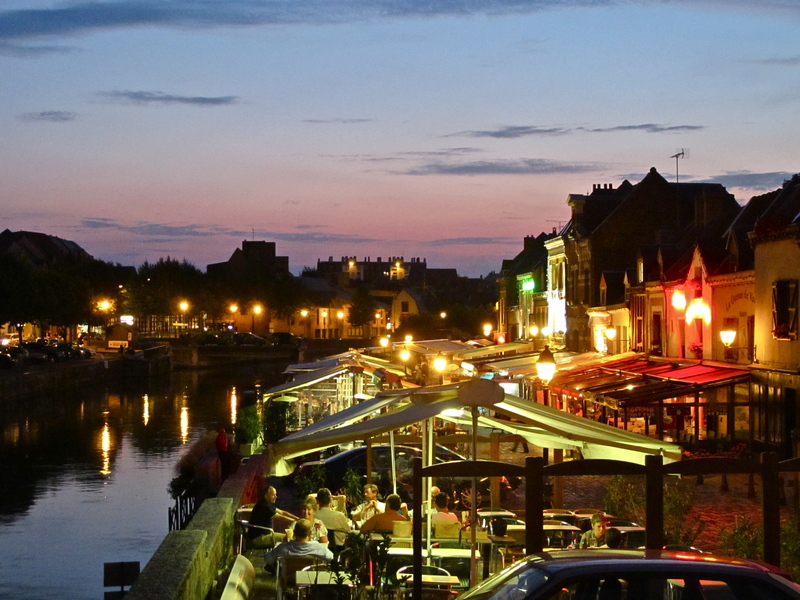 Dinner beckons, and we turn to face the Quai Bélu, with its endless stream of delightful eating places. 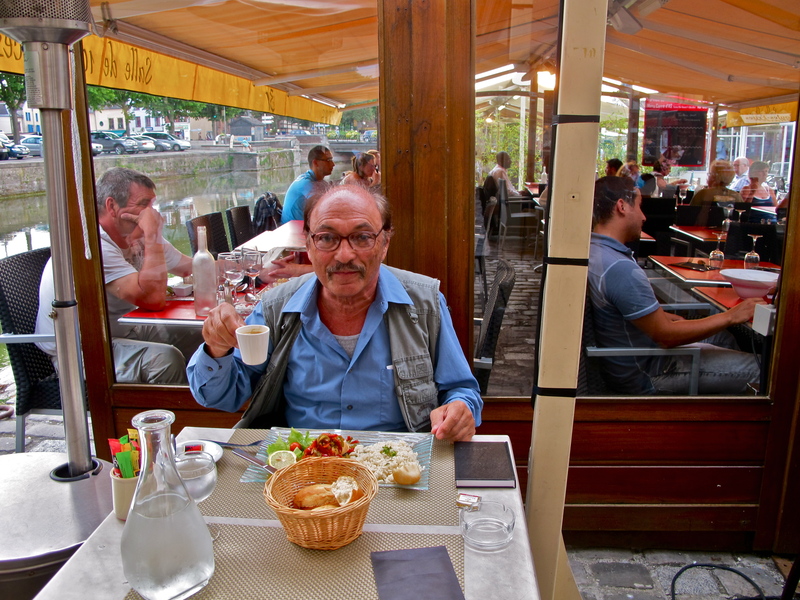 Outdoor dining is one of the many pleasures experienced throughout Europe. In fact, Rome puts up outdoor heaters for diners in front of the Pantheon, Sweden provides blankets for warmth. Here is one happy diner! Crossing a second bridge a bit to the east, we look back at the reflections in the relatively still water. It is a feast for the eyes. 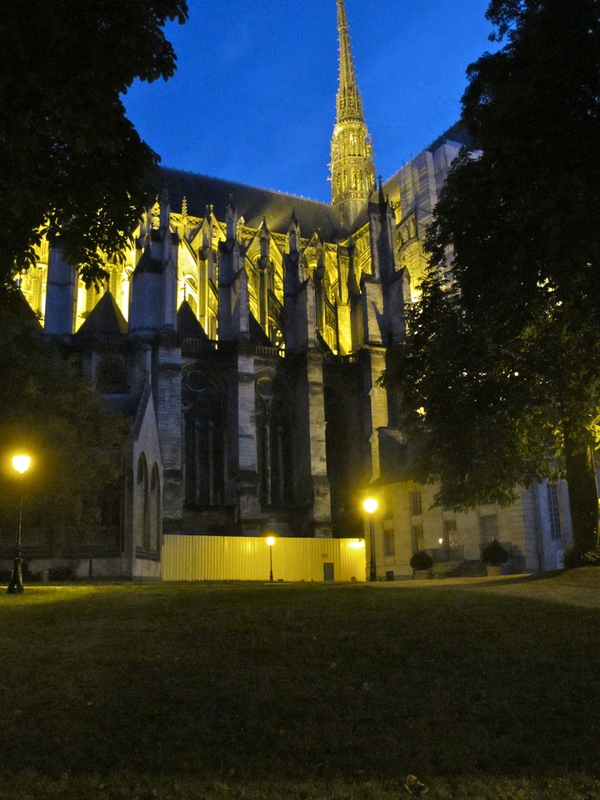 Now back to the Cathedral. 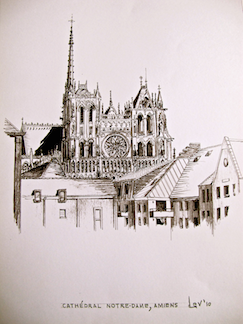 First the northern side, then the facade, all of which we shall further detail. 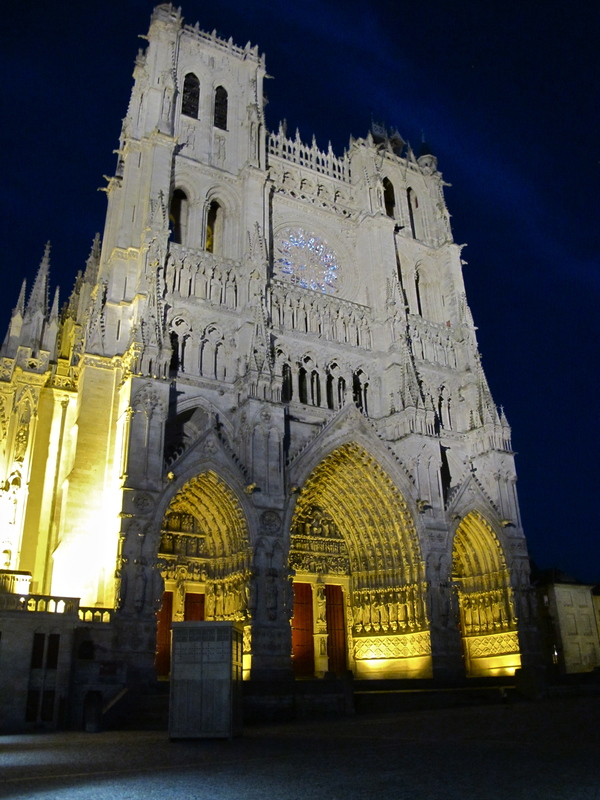 But before we view the most astounding polychromatic projections onto the building facade, which brings back the glorious years of the “Bible of Amiens,” we will start at the actual beginning of this latest odyssey to Amiens. 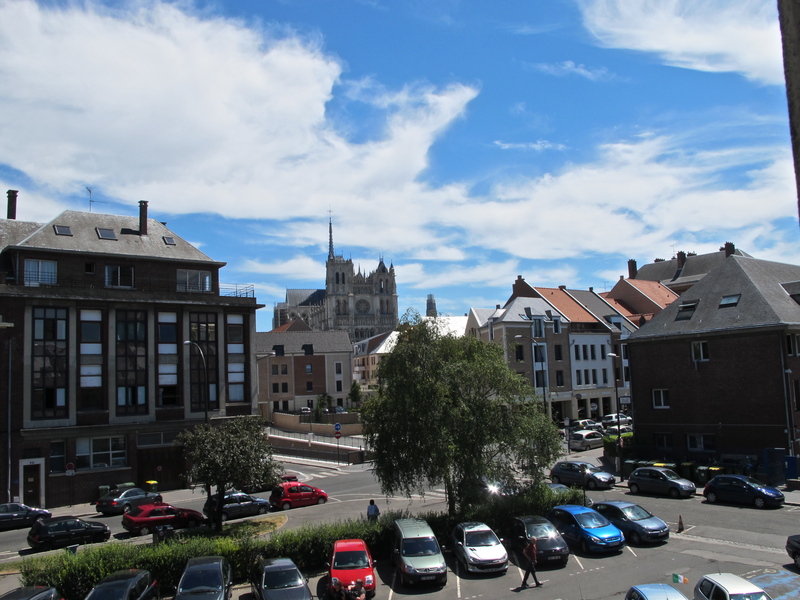 This view is from my modest hotel bedroom, which despite its humbleness afforded a most spectacular view of the Cathedral.